I have decided to move my blog to a new site. To read all future entries you will now have to click HERE. Carol tells me there’s a plan to put a road bridge across the river here that would take much of the heavy traffic away from the city’s core; from the point of view of convenience, Petrie Island is the most logical place for the bridge, but how it would spoil the view. C’est la Journée Internationale des Personnes Agées, so I discovered when I visited an old lady at the Manoir Héritage retirement residence in Vanier this morning and a notice to that effect was slipped under her door. We talked to one another in French while the sun shone on the golden trees we could see through the window and while Claude poured tea into a pair of pretty teacups that were among her few remaining possessions. I can imagine*. It’s lucky that our own house has that basement with long walls against which we can put plenty of bookshelves, but what to do when Chris and I, one day in the distant (I hope) future have to move to somewhere like the Manoir Héritage? It’s a sobering thought. I was trying to tidy up our bookshelves last night but not getting far with the job as it’s too tempting to open the various books as I move them around. I try to keep the novels in alphabetical order of authors and (as I’ve said before in this blog) it always gives me a kick to see who comes next to whom. Kipling, Koestler, Kundera … S. Maugham next to Melville … Tinniswood, Tolkien, Tolstoy. Tom Sharp next to Carol Shields. Jeanette Winterson next to PG Wodehouse. I asked Claude how she had managed to select the few books she had rooms to keep and it was interesting to hear that the most precious were her Larousse, her art books en masse and the travel guides to places she and her husband had visited. I noticed a copy of The Seven Pillars of Wisdom (in English) but was sitting too far away from her bookshelves to make out any more titles. I wonder which books you people would choose to retire with? Any comments? Your imagination is a renewable resource. I hope my imagination’s still alive and kicking in my old age. Here’s what I learned at the Musée Canadien des Civilisations across the river when earlier this month I visited the current exhibition there, Trésors de la Chine. A mountain symbolises stability and tranquility. Surging waves and mountains in a picture stand for riches and a long life. The peony is the king of flowers and a symbol of spring, beauty and honour. A gourd stands for a high salary, or fertility. Pomegranates are a token of numerous male offspring. The sight of a day lily will help people to forget their sorrows, perhaps because these flowers can be “consumed” (as the exhibition notes put it) as an anti-depressant. The Chinese word for “bats” is a pun on “fu”, meaning good fortune, so many Chinese artifacts feature flying bats. The image of an egret and a lotus conveyed the wish for success in passing exams and in getting promotion. On Labour Day, September 3rd, Carol, Francine, my mother and I paid a visit to the Montreal Botanical Gardens, Le Jardin Botanique de Montréal. After wandering through the rose garden, the native garden, the shade garden (remarkable for its range of begonias) and past the ponds, we came upon the Japanese and Chinese Gardens in the centre, which are gifts to the city from these countries. The name of this small building refers to a poem penned in the 9th century by Bai Juyi describing an emperor’s melancholy as he stood before the deserted pavilion where his love once lived. The woman was killed to save the kingdom from violent uprisings. 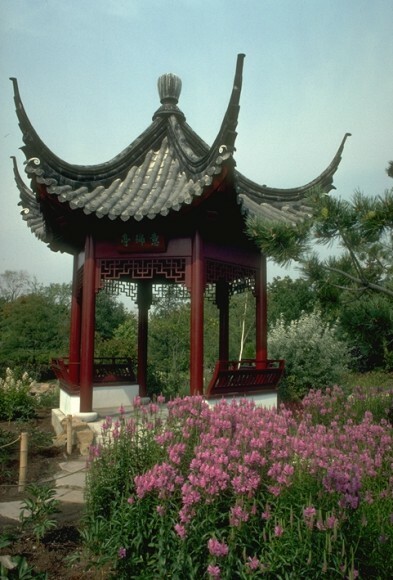 Practically every feature of the Chinese Garden is meant to be symbolic. The rocks and stones, some imported from China despite the fact that Quebec isn’t exactly short of rocks itself, represent the masculine element (Yang), the water features being the feminine (Yin) that flows around them. Elaborate lanterns were hanging over the pathways and pavilions and floating in the ponds: boats, dragons, birds and fish, their garish colours rather excessive, but they were beautifully made for the Lantern Festival. There’s a harmonious mixture of the artificial and the natural, with lotus buds, symbols of purity, opening in man-made ponds and decorative gaps in the walls revealing the trees and flowerbeds behind. A girl in the Friendship Hall was playing the erhu, the traditional Chinese equivalent of a violin. Her name is Shen Qi, whose blog you can access here. Disconcertingly, her instrument was plugged into an electronic amplifier and the melodies she was playing, admittedly in the Chinese style, were western (Amazing Grace, etc.). It was Shen Qi who played the theme music for the wonderfully original 2003 French-Canadian film La Face Cachée de la Lune by Robert Lepage, which has no connection to anything oriental as far as I remember, apart, perhaps, from the goldfish who plays a pivotal role in the plot. I bought the video of this film because I’d so much admired Lepage’s one-man stage version when I’d seen it at the NAC. When I asked Shen Qi about this though, she confessed that she’d performed the music without ever seeing the film. While Chris was reading a back copy of the London Review of Books in the bath last night, he came across a reference to Ernst Toch, an Austrian-Jewish composer who in 1930 wrote a fugue for voices, known in English as The Geographical Fugue. The extraordinary thing about it is, this is a composition for spoken voices. You live and learn! Looking this up on the Internet at my husband’s request, I made another gratifying discovery, an amusing article about the composer by his grandson, Lawrence Weschler, in The Threepenny Review, who calls The Geographical Fugue a kind of “Weimar rap”! By clicking here you can hear a short excerpt. Clever, isn’t it? In case anybody was wondering, Ratibor is the German name for a town in Silesia, now in Poland.